Monthly birthday celebrations are back! We started monthly birthday parties with the first set of boys we took in, and invited friends to come and celebrate their birthdays with us too. After a short intermission, monthly birthday parties (MBPs) are back! We sent the word out a couple of days before, and received three guests at the Home this Saturday. We would really love for you to join us one of these days… MBPs are celebrated on the last Saturday of the month from 1-5pm at our Respite Home in Jakande, Lekki. If you celebrated your birthday (or an anniversary) in the month, you should come party with us! You can be sure to have a good time. Our cook, Chioma, receives high praise, and we are known for our hospitality 🙂 Plus, the kids will really love it. Having the monthly celebrations gives them something fun and exciting to look forward to every month, apart from the occasional visits and outings they may receive or take part in during the month. We would also very much appreciate if you could come with treats to share, or games, toys, used clothes or even provisions for the Home! We are always grateful. At this month’s party, we had a really amazing time. There were 15 boys at the Home. Six were fresh from the streets, having been informed of our party the day before by a couple of visiting boys. Eight of the boys are currently resident at the Home, and another boy is under assessment, but stayed over because of ill health. However, he is much better now, and very eager to join the resident boys. Tosin Jegede and Toju Okotie came around again, and Keno Egbuwoku, who was invited by Toju, also visited. Keno also came with a pack of delicious chocolate treats, which everyone enjoyed! The three of them made a very energetic team, as they danced and played with the boys, showing them new moves. 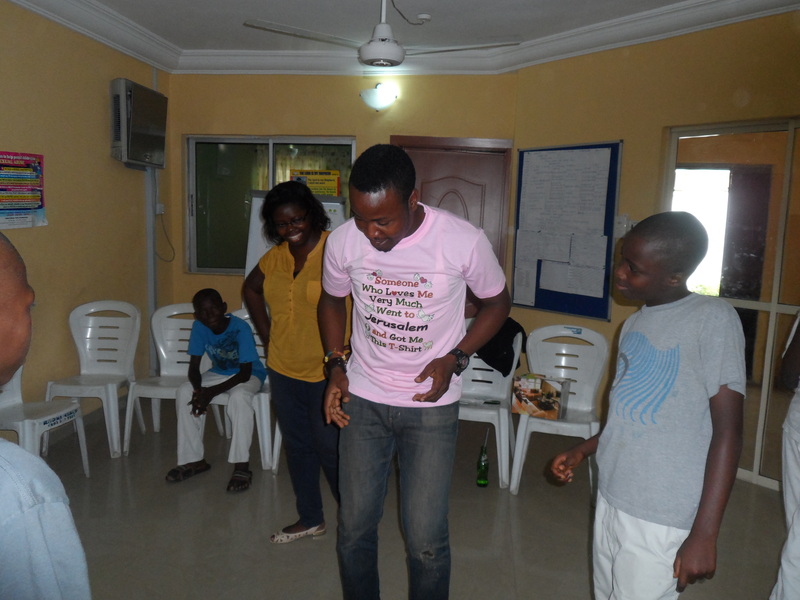 Tosin and Toju stayed long enough to watch the resident boys do their dance presentations which they had practiced earlier in the week, and took their lunch packs with them. After they left, the party continued, with lots of dancing! There was musical statues, then musical chairs, and finally, a dancing competition. Five boys received prizes for their efforts. There was also a little feedback session with the boys to find out what they would like to do next time to make the party more fun and entertaining. The addition of comedy segments, drama presentation and talent search were added to the party plan for next time. Before the party finished, Ufuoma presented MTN donated school bags, packed with school supplies (exercise books, drawing books, maths set, calculator, pencil case with ruler, colouring pencils, pencils and pens etc) to the resident boys. After displaying the contents to the roars of the excited children, each of them were given their bag and photographed in their ‘back to school’ pose. The visiting boys looked upon them jealously, and said that they would like to visit again and hopefully join our current set. A small chocolate cake was cut and shared between all the boys and staff. After the day’s excitement, the boys helped to tidy up and settled down for the evening. It was really a lot of fun, and we hope that you will be with us next time. Keno is keen to come back, and has promised not only to bring her music deck for us to use, but to come and help us fix up the TV, which has been broken for a couple of weeks. Isn’t it great to have friends? Fair Life Africa Foundation wishes to appreciate all our friends who made the 29th of September a successful and fun day for the Home and the kids. Come back again soon! !